Whispers in the Loggia: Martino On the March. Again. Martino On the March. Again. In a letter to the heads of three local Irish-American organizations, the Roman Catholic Diocese of Scranton has threatened to close St. Peter’s Cathedral during St. Patrick’s Day celebrations if the groups feature elected officials who support abortion rights at their annual events. In direct terms, the letter reiterates the bishop’s publicly stated position that elected officials who vote to support abortion rights will be denied Holy Communion if they attempt to receive the sacrament in the diocese, including at St. Patrick’s Day Masses. The closing of St. Peter’s Cathedral is offered as an additional measure to prevent the honoring of such officials. The annual St. Patrick’s Parade through downtown Scranton is one of the largest in the country, and the dinners hosted by the Friendly Sons and the Society of Irish Women often have featured prominent national and international figures. Last year, President Barack Obama, then a senator, spoke at the Irish Women’s dinner; Irish Prime Minister Bertie Ahern spoke at the Friendly Sons’ dinner and Secretary of State Hillary Clinton, then a senator, marched in the parade. In recent weeks, Martino's likewise made headlines for publicly correcting one of his own parishioners -- Democratic US Senator Bob Casey -- for a January vote against an amendment that would've reinstated the "Mexico City" policy overturned by President Obama in his first hours in office, and for expressing his "absolute disapproval" over a local Catholic university's honoring of Keith Boykin, an openly-gay author, Clinton administration staffer and Harvard Law classmate of the President. 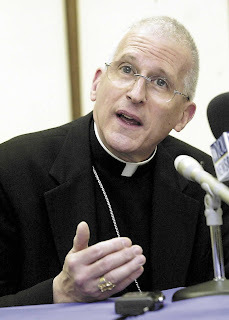 In a statement issued Monday -- a day before Boykin's appearance at Misericordia University -- Martino termed the invitee's views "disturbingly opposed" to the church's moral teaching and "so antithetical to Catholic teaching," rapping the Sisters of Mercy-run college for, he said, "seriously failing in maintaining its Catholic identity." Late last month, the Scranton diocese announced that, due to falling numbers of priests and fewer resources to go around, almost half its 209 parishes will be closed or consolidated.